If catching fish is important to you when you're out on the salmon river then after the ghillie has briefed you on the pools you've been allocated it's equally as important that you 'consistently' deploy an effective salmon fishing plan to give you the best chances of success. Whatever salmon pools you've been allocated to fish during the morning or afternoon salmon fishing session work out the time you've got and apply it to the fishing effort as best you can. Make sure you've had at least one quality & properly spaced swing through each pool and you haven't sat about wasting fishing time or moved too slow where you haven't managed to fish all of the likely salmon pool holding areas. In other words pay attention to the time you've got and use it wisely & carefully during each fishing sessions. The above is far more achievable if you've had a professional salmon guide fully demonstrate what excellent riverbank movement looks like and how moving too slow through a pool will only train salmon to accept the presence of your fly. Less is definitely more in salmon fly fishing as if you space each fly swing by at least 3ft you'll increase a salmon's chance of making that snap decision! In addition to that you'll cover far more water each hour and 'massively' more so if you're moving effectively over the full course of the salmon fishing day. Apply a calculated & consistent salmon fishing effort but stay tuned into the river and if you get that 'nudge' to adjust tactics at any point during the fishing day then respond to that thought. The difference between success or a blank day in salmon fishing is often having the freedom of versatility to react to these little fishing notions that come from your gut to your mind. This could be anything from a change of salmon fly pattern to a heavier or lighter sink tip to the one you chose at the start of the fishing day. After deploying a consistent 'time aware' salmon fishing effort throughout the full course of the fishing day whilst making any adjustments as and when you're self prompted to do so then at the end of the salmon fishing day you'll know you've done your best regardless of whether a salmon has introduced itself or not. 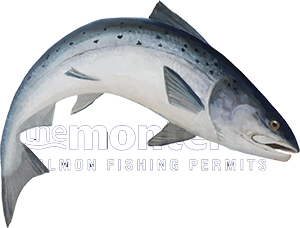 Salmon fishing is an amazing pursuit as you never truly know what lies ahead which is another largely forgotten yet exciting component of this fantastic sport. Never compare it to a put & take trout fishery where results are more or less guaranteed and respect the challenge of this game. Enjoy your fishing day and understand that if you've got the above tactical fishing approach in good order you'll be a certain number of casts away from a salmon's attention and that can could be with your very next cast!